Most ponds will need cleaning from time to time, a regular clean annually should suffice if a maintenance schedule is in place. 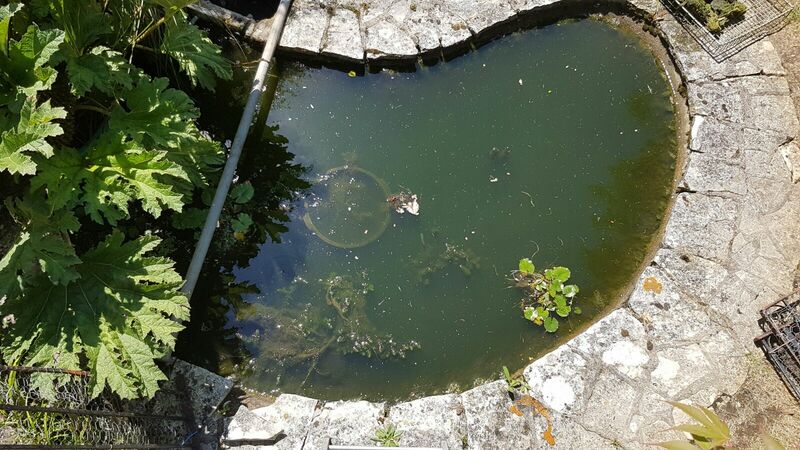 There is a right way and a wrong way to clean a pond, and the team from Pond Stars UK are the best of the best when it comes to Pond Cleaning, knowing exactly what is right for the health and maintenance of your pond, fish and its other wildlife. 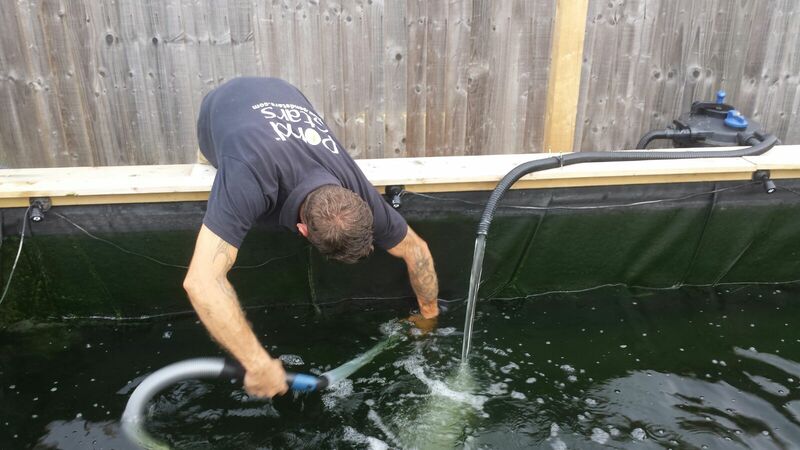 With over 15 years’ experience in pond and koi keeping, our team are the best at Pond Cleaning. 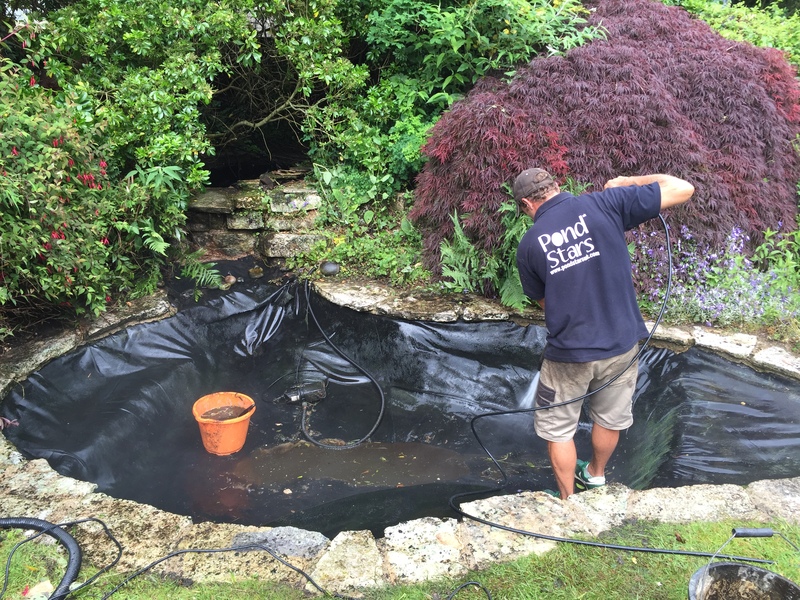 We take care with our pond cleaning services, carefully removing any pond plants, placing any fish/koi into a temporary pool for the duration of works. A comprehensive pond clean starts from £100 – length/width/depth and level of planting affects final cost. Do you think your pond needs a clean? Pond Stars UK offer a FREE no obligation quote for all types of pond services including Pond Cleaning. Although your pond is equipped with an advanced filtration system, it still requires a certain degree of attention and care to continue to appear and function at its best. In nature, fish live in vast quantities of water. In your pond, hi-tech filtration methods go above and beyond mother nature’s abilities to keep such a small body of water clean. In fact, many ponds with heavy fish loads or excessive debris require more frequent cleaning. On the other hand, lightly stocked ponds with littleto no debris, or well-maintained ponds might extend the time between cleanings to two or even three years. Regardless of the timing, a clean (not “clogged”) bio filter will greatly improve pond water clarity and quality. Perhaps the most important maintenance task is a weekly clean out of the skimmer. This involves emptying the skimmer basket of leaves and other debris, and rinsing the skimmer mat as needed. Keeping the skimmer clean, helps to ensure that your pond stays free of unsightly debris that might otherwise cloud and degrade water quality, and clog up the pump and/or bio filter. Although your pond will water your aquatic plants for you, they still need occasional trimming and other attention. Water lilies and lotus among other fast growing aquatics require repotting just about every year. This will ensure that they have room for new growth, and along with monthly fertilization will keep them looking their best. Dead growth should be removed to prevent it from fouling the pond water. Keeping plants free of dead or dying foliage/flowers will also promote flowering and/or vegetative growth. Probably the most important aspect of water gardening, water quality, is often overlooked. In order to be healthy, a pond must be in ecological balance. This is achieved through biological filtration and plants. Goldfish, koi, and other pond life expel highly toxic ammonia into the water through respiration and excretion of waste. The decomposition of organic matter such as leaves and cedar needles/berries, along with any runoff that might enter the pond, can also contribute to spiking ammonia levels. Testing of your pond water for ammonia, nitrite, and pH levels should be done at least once a month to ensure your water quality never dips to dangerous levels. There are many facets to water quality, if you would like more information, ask to speak to one of our service representatives. Over time, the build-up of decaying organic matter within the pond, and the natural biological filtration process will create a surplus of nutrients in the pond. While aquatic plants such as water lilies will utilize some of these nutrients, you may experience an algae bloom if steps are not taken to keep water quality optimal. The three types of algae most commonly encountered by pond owners are string algae (hair like growth that can grow to enormous size), single celled algae (or green water algae – looks like “pea soup”), and carpet algae (a thin layer of growth over liner, rocks, plant pots etc.). 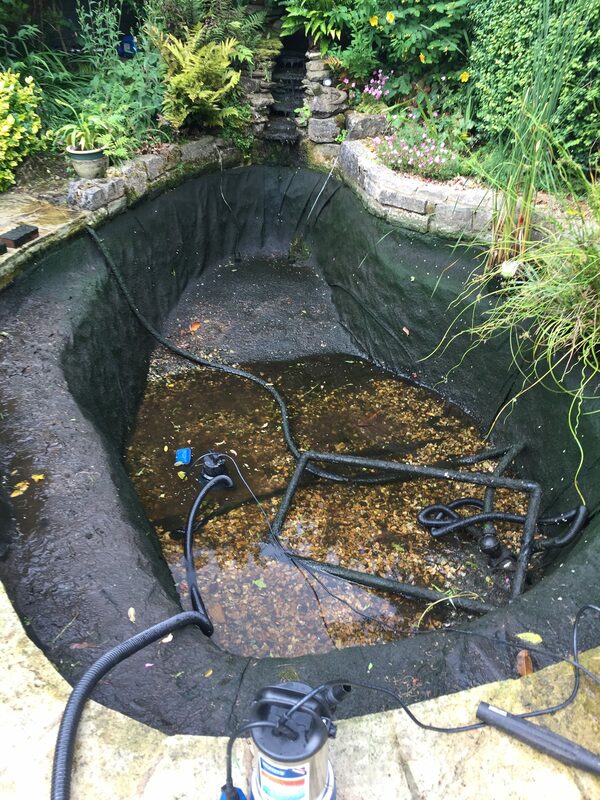 Whilst a small amount of algae in the pond, especially carpet algae, can be beneficial, in excess it is unsightly and starves other aquatic plants of nutrients. Prodigious algae blooms can also rob the pond of dissolved oxygen at night, which can cause pH swings and seriously upset fish. There are many ways to curb the growth of algae in the pond, and/or keep new growth from forming. Speak with a service representative for more detailed information on combating algae. 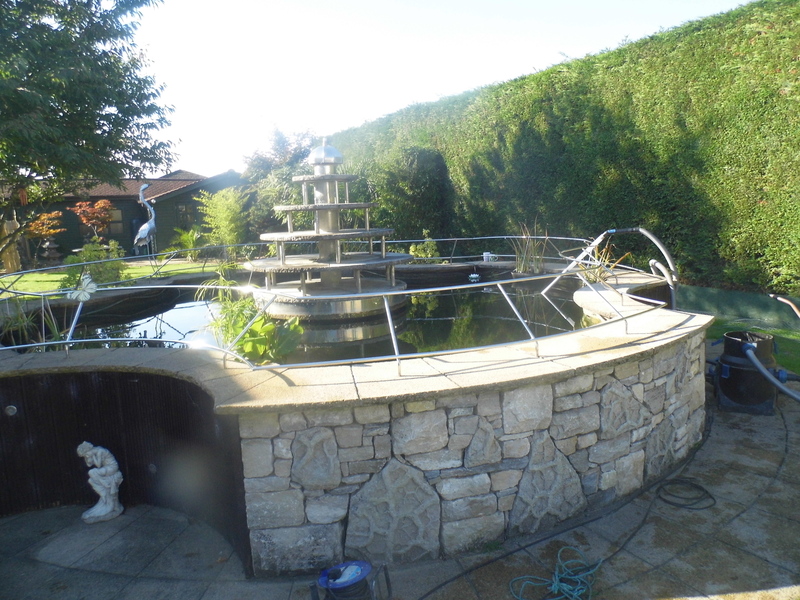 We at Pond Stars UK are happy to offer full service maintenance for your pond or water feature.